Financial sector website news As of the close of March 29, the Shanghai Composite Index closed at 3090.76 points, up 5.09% in March. The Shenzhen Component Index and the GEM index closed at 9906.86 points and 1693.55 points respectively. The Shanghai and Shenzhen 300 Index closed at 3872.34 points, and rose by 5.53% in March. 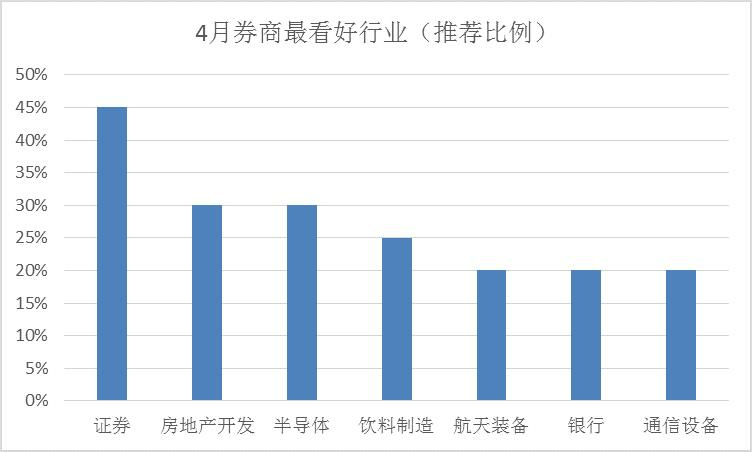 In March, all the industry's blushing, Shenwan's first-level industry, agriculture, forestry, animal husbandry and fishery industry rose the most, with a cumulative monthly increase of 17.54%, the food and beverage industry cumulative monthly increase of 16.22%, the computer and light industry manufacturing industry cumulative monthly increase of more than 14 %, there is little difference between the increases. The results of the financial sector's monthly super-matching industry selection in March have also been released. According to the industry statistics compiled by various brokers, the top three winners in the March list were: Huachuang Securities, Zhongtai Securities,Shanxi Securities. 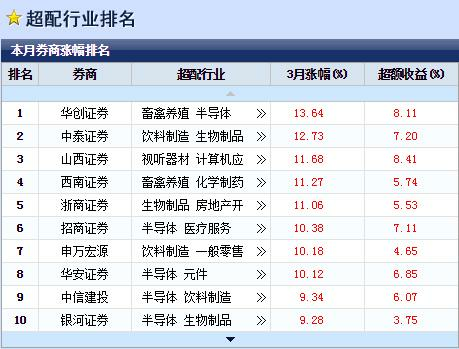 Huachuang Securities topped the list this year. The industries deployed in March were: livestock and poultry farming, semiconductors, computer applications, securities, and aviation equipment. Among them, the livestock and poultry breeding, semiconductor and computer application industries were among the top gainers. In the forward-looking report of the A-share market in March, Huachuang's strategy team believes that investment opportunities in March will focus on investment opportunities such as electronics (integrated circuits), new energy vehicles, and communications (5G), while referring to hot industry focus securities. industry. It can be seen that the industry configuration is relatively high. For the April configuration, Huachuang Securities has deployed six industries: securities, aerospace equipment, white goods, communications equipment, beverage manufacturing, and electricity. In the second place of Zhongtai Securities, when the March market was laid out, the China-Thailand strategy team suggested focusing on the stability of performance and the theme opportunities related to the two sessions. In March, four industries were deployed for beverage manufacturing, biological products, general retail, and medical devices. Compared with the general retail and medical device industries, the beverage manufacturing and biological products industries have risen relatively high, which has increased the total increase ranking. Zhongtai Securities deployed five industries in April: chemical raw materials, industrial metals, insurance, banking, and housing construction. Shanxi Securities, ranked third, deployed four industries including audio-visual equipment, computer applications, cement manufacturing and environmental protection projects in March. Shanxi strategy team said in the March market strategy report that on the one hand, the high-elasticity sector (non-bank and small-cap technology), which has been recommended in the previous period, has gradually lowered its position to lock in profits; on the other hand, it can focus on the previous period. The value is still in the historical low. Due to the highest increase in the installed audio-visual equipment, it is only one percentage point lower than the second-place Zhongtai Securities. Shanxi Securities only deployed three industries in April: rare metals, industrial metals, and chemicals. Zhongtai Securities: On the whole, as the effects of structural policy easing begin to emerge, the market will also present more and more structural opportunities. Under the catalysis of social and economic data in March, the market will continue to revolve around April. Pessimistic expectation of repairs unfolds, but the strength of the policy and fundamentals determines the width of the market. April market, it is recommended to focus on the two dimensions of the quarterly report and the upswing. 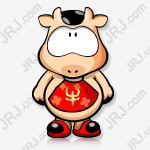 China Merchants Securities: Entering April, continue to see more markets, the market's main logical liquidity is reinforced rather than weakened; residents' funds enter the market to speed up; performance announcements, the science and technology board gradually approaching, the new industry trend is more and more invented. On the external front, the Fed’s loose expectations are growing and the Sino-US negotiations are relatively smooth. In April, the market structure will be more balanced. Not only the emerging industries and science and technology creation themes, real estate construction and other stable growth sectors, the financial cycle sector, the consumer sector will show a continuous increase. If there is a callback in the middle of the month, it is a chance to increase the position. CITIC Construction InvestmentIn the industry configuration, investors are advised to configure along the decline in credit interest rates and exchange rate appreciation. In the context of falling interest rates and economic recovery, real estate and home appliances continue to benefit, and valuations are at a low level, which is the optimal asset. Second, growth stocks are still dominant in interest rate declines. In the direction of exchange rate appreciation, aviation is the most beneficial, while the superimposed economic recovery promotes the recovery of demand and the contraction of supply. Value-added liquors such as white wine that are continuously allocated by foreign investors are also worthy of attention. As the market continues to rise, the brokerage sector is the main line of the entire bull market. Investors are advised to continue to raise their positions in a comprehensive manner. At the same time as holding growth stocks, they will add blue chip companies such as brokers, real estate, home appliances, airlines and liquor to welcome the rise of the stock market in April. The most optimistic industry for brokers in April is shown below. Don’t buy money with emotions.